Along with the rest of the nation, my heart ached for Boston on Monday and continues to do so. I still have yet to make sense of any of it, or the type of suffering or unhappiness it takes for a person or persons to be capable of such hatred, but I am in awe of the solidarity and hope that tragedies like this instill in people. There’s an internet meme (the seemingly favored method of expression among my generation) circulating, courtesy of everyone’s favorite neighbor Mr. Rogers, that I found helped me to not lose hope in all of humanity. It is so true what what he says of helpers. The human spirit is incredible. Truly. From my involvement with Austin’s local running and racing culture, I can say first hand that this industry exemplifies and champions the spirit of hope and goodwill as good as any I can think of. So many helpers. This tragedy hit home on many levels: first because I’m a human, second because I’m a runner (a great friend and fellow marathoner, Luke Marshall, more than adequately [wonderfully, in fact!] described how it felt for a group you identify with and esteem to be targeted), and third because I’ve always been in love with Boston and all of New England. I’ve romanticized this part of the country since I can remember, and as soon as I leave I’m always ready to go back. 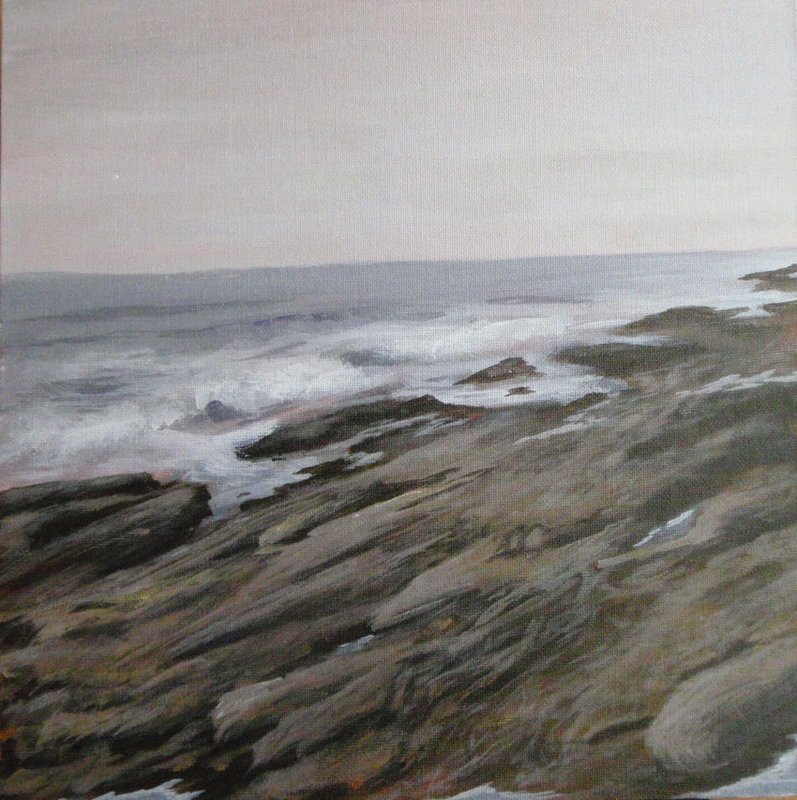 Monday, I wasn’t thinking about it, but I began painting a seascape from Maine. It’s not Boston, but it’s not far. I think my heartstrings were subconsciously pulled to that part of our wonderful country. I finished it yesterday. It’s an almost tumultuous scene, with the crashing waves and the jagged shoreline, but there’s something oddly calming and therapeutic about it. Peace and love to each and every one, today and always! It pains me so much that fanaticism will not disappear. I can only tell you that encouragement to your wonderful country. With regard to your new work seems exquisite in the lines and the combination of gray and green rocks. Could not agree with you more. Aren’t we more evolved than this? Thank you for the wonderful compliment, I hope you are well! I look forward to your next painting.